This Nativity scene is made of clay figures that are covered with tiny beads in intricate patterns. The beads are held to the clay with soft beeswax, so the beadwork is very fragile. The set includes 13 pieces: Joseph, Mary, baby Jesus, an angel, two shepherds, four animals, and three wise men. The figures are 5 inches tall. This Mexican Indian folk art, with its roots in pre-Columbian times, is based on the shamanistic religion of the Huichol people. Beaded gourd bowls decorated with god and animal symbolism were the first pieces created in this manner, predating the introduction of glass beads by European missionaries. As more of the contemporary world becomes aware of this art form, many of the Wixaraca (“Huichol” in the Huichol language) are expanding their artistic talent to include new materials (such as pottery and ceramic pieces, metal-based work, and animal skulls) to their traditional work of carved wood jaguar heads, egg-shaped ornaments, animal figures, and gourd bowls. The artist, Santos Villa, lives on a small family ranch called Agua Zarca, not far from the air strip in San Andres Cohamiata, the ancient Huichol ceremonial center located deep in the Sierra Madre mountains of Western Mexico. Santos learned his trade from his wife Marielena. She is the granddaughter of Jacinto Lopez Ramirez, an elder Huichol Mara’akame or shaman who is widely recognized as one of the pioneers of the Huichol bead art from the 1960s. Jacinto has been featured in many books including 'The Art of the Huichol' on page 125. 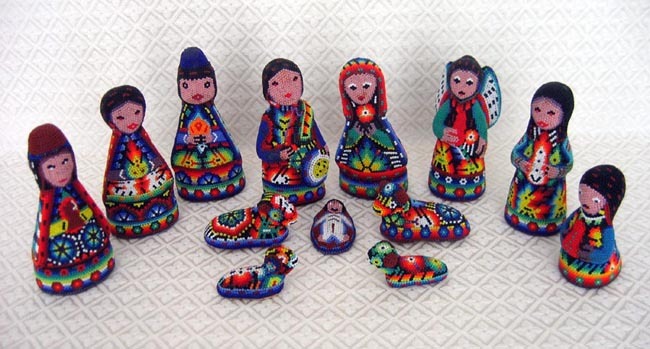 We purchased this Nativity through Peyote People, an organization that has been recognized by the Huichol Traditional Government of San Andres Cohamiata for its work in the community. Peyote People started a Fair Trade co-operative that promotes cultural authenticity by working directly with Huichol Indians who actually live in the Sierra and are actively involved in the preservation of their culture’s traditions.